Step 1 Zest the lemon; set the zest aside. Add the juice of the lemon to a bowl of water. As you prepare each artichoke, place it in the bowl of lemon water to prevent discoloring. Step 2 To prepare the artichoke, hold it in your left hand with the stem facing toward you and the tip facing away. Slowly turn the artichoke against the sharp edge of the knife while making an abbreviated sawing motion. (It's easier to control if you use the base of the knife rather than the tip.) You will begin to cut through the tough outer leaves; when you can discern the natural cone shape of the artichoke, adjust the knife to follow it. Keep trimming until you've cut away enough of the tough leaves so you can see only light green at the bases. Cut away about the top half-inch of the artichoke tip and dip the artichoke into the lemon water so the cut surfaces don't get discolored. Step 3With a paring knife, trim away the very tip of the stem, then peel the stem and base of the artichoke, going from the tip to where the base meets the leaves. You'll have to do this at least five or six times to make it all the way around the artichoke. When you're done, there should be no dark green tough spots left, only pale green and ivory. Step 4Cut each artichoke into lengthwise quarters, and if there is a fuzzy choke inside, cut just below the choke to the very base of the leaves and the choke will pop off, leaving a clean heart below. Cut the artichoke into half-inch pieces and place in the lemon water. Go on to the next artichoke. Step 5Bring the chicken stock and 4 cups water to a boil in a large saucepan. Reduce the heat to maintain a lazy simmer. Step 6In a large skillet or pot over medium-low heat, cook the minced onion and drained artichoke in 2 tablespoons olive oil until the onion is soft and fragrant, about 5 minutes. Do not let the onion brown. Add the tablespoon of minced garlic and cook another minute or two. Step 7Add the rice and increase the heat to medium. Cook, stirring, until the rice makes a kind of clicking or "singing" sound as it scrapes the bottom of the pan and you can see the outside of the kernel become translucent, about 2 to 3 minutes. Add the wine and cook, stirring, until it evaporates completely, about 3 minutes. Step 8Begin adding the simmering stock, between three-quarters and 1 cup at a time. Cook after each addition until the stock has evaporated enough so that you can see the bottom of the pan come clean when you scrape it with a wooden spoon, about 5 minutes. Add the salt. Repeat, adding more stock each time, until the rice is chewy but tender, with no chalky center. This will take about 20 minutes in all. You don't need to stir continuously, just when you add the stock to the pan and when it is nearly dry. You will not use all the stock. In Recipes-list.com we have selected the most viewed recipes from category - Sides . Enjoy the best recipes specially selected for you! 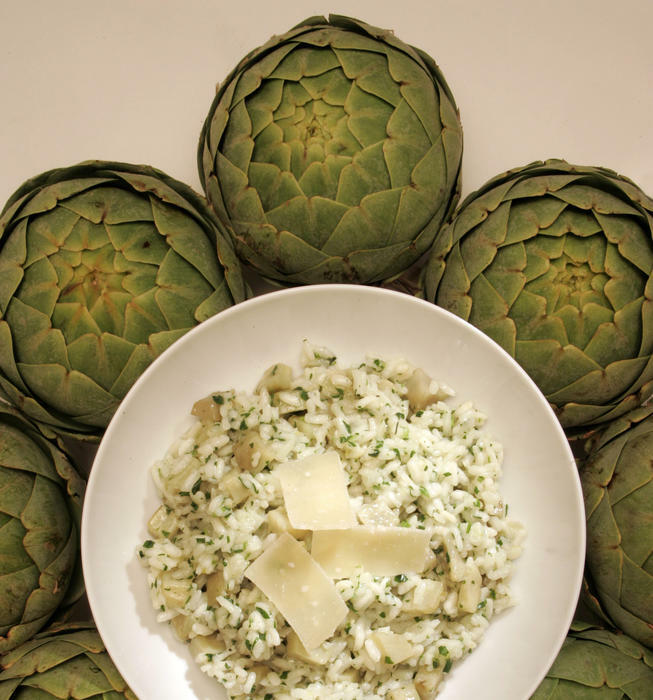 Artichoke risotto with lemon zest is the right choice that will satisfy all your claims.